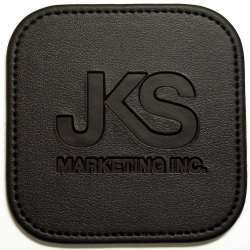 Our coasters are made with a leather-like vinyl (Morbern Ambassador) or quality leather and come in round or square shapes. N.B. The coasters shown are examples of the embossing and hot-stamping options - please see our Hot Stamping and Embossing page for more details about our personalized coasters. These coasters are ideal protection for executive boardrooms, office desks and other fine furniture.